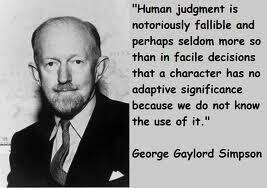 George Gaylord Simpson was born in Chicago, on 16 June 1902. He was the third and last child of Helen J. (Kinney) and Joseph A. Simpson, having been preceded in the world by his sisters, Margaret (1895-1991) and Martha (1898-1984). His father was an attorney who handled railroad claims, but he soon became involved in land speculation and mining in the West, which resulted in the family's resettlement in Denver while Simpson was still an infant. The family's Scots ancestry and missionary background led to a strict fundamental Presbyterian upbringing for the young Simpson, but he turned his back on formal religion by his early teens. As a boy Simpson was curious about everything. He talked his parents into subsidizing his purchase of the now classic eleventh edition of the Encyclopedia Britannica, which he then read straight through. It became the foundation of what was to become a huge personal research library, and he was still using it at the end of his life. He also kept a notebook in which he recorded random information, including such dubiously useful data--to a young boy at least--of the densities of various materials. Simpson had only a few close friends in childhood, chiefly a neighborhood chum, Bob Roe and his sister, Anne, whom Simpson would marry years later. In old age Simpson reminisced about his childhood and noted that being more intelligent, shorter, and redheaded had guaranteed antagonism from his peers. He was also afflicted with an eye condition that made it difficult to follow the flight of a ball--a serious handicap preventing his participation in virtually all team sports. His father, sister Martha, and Bob Roe all enjoyed the outdoors, so Simpson spent much of his youth exploring the Rocky Mountain landscape, which undoubtedly fed his life-long interest in natural history. Simpson attended Denver grammar and high schools. Although missing much school owing to eye ailments and appendicitis, he managed to skip grades and graduate from high school close to his sixteenth birthday. In the fall of 1918 he entered the University of Colorado at Boulder. He was vague about what to major in, although he thought he wanted to be a creative writer. In his second year he enrolled in a course in geology and was quickly converted, in part because of the enthusiasm of his instructor, Arthur Tieje, and the mutual respect each developed for the other. It was in this geology class that Simpson learned the importance of trusting his own observations, even those contrary to perceived truth. On one particular field trip, when he found a terrestrial dinosaur bone in a deposit that was clearly marine in origin, he was told that he was mistaken about the bone's location. Simpson quietly stuck to his guns, reasoning that the bone must have been washed in from a nearby river. And, of course, he was right. In his senior year Simpson transferred to Yale, because he was advised that if he wanted to be a geologist and paleontologist, Yale was the best place to study. Other factors may have played a role in his decision: he had lost his girl to his best friend and his position on the literary magazine he helped found was in dispute. Yale's requirements for graduation were more stringent than those at Colorado, so Simpson had to make up several general education courses, among them a foreign language. As a result, Simpson spent the summer of 1923 in France, quickly boning up on French so he could pass a test when he returned to Yale enabling him to graduate retroactively, as it were, with the class of 1923. In February of his senior year, Simpson married Lydia Pedroja, whom he had met at the University of Colorado and who was now attending Barnard College in New York City. Yale at that time did not allow its undergraduates to marry, so Simpson and Lydia were married secretly. His parents apparently did not know of the marriage right away either. This betrayal of his parents seems to have plagued Simpson all his life and may explain his overly deferential attitude toward them well into his middle-age. The marriage thus got off to a troubled start. Simpson continued at Yale as a graduate student in paleontology, but Lydia's mental instability soon became apparent and compounded the normally difficult circumstances of graduate students burdened with young children and meager incomes. Despite their problems, Simpson and Lydia were sufficiently congenial to produce four daughters in their first six years of marriage: Helen, Patricia Gaylord, Joan, and Elizabeth. In the basement of Yale's Peabody museum, Simpson discovered a large collection in storage of primitive mammals from Mesozoic-age rocks of the American West. Despite the initial lack of encouragement from his doctoral advisor, the distinguished paleontologist Richard Swann Lull (1867-1957), Simpson decided to study these mammals for his dissertation. Lull's hesitation arose from his uncertainty that Simpson was qualified for the task. Worse, Simpson had earlier annoyed Lull by his elaborate preparation for Lull's lectures on vertebrate paleontology. In class Simpson would visibly tick off in his own notes various points as Lull covered them. Lull found this unnerving and asked Simpson to stop. Simpson continued the practice, but unobtrusively without Lull's noticing. Simpson received his Yale Ph.D. in 1926 and went on to the British Museum of Natural History in London to continue his study of primitive mammals by examining the British and European specimens held there. His wife Lydia decided that London was too unpleasant, so she took their two daughters and spent the year in southern France, which further stretched family finances. Yet the separation gave Simpson the freedom of a bachelor in an interesting foreign capital. He thoroughly scouted London, the English countryside, and made occasional side trips to the continent. He was able to meet the leading scientists in his field as well as indulge his growing interests in art, sculpture, and architecture, foreign languages and customs, and he imbibed a cosmopolitanism hitherto denied the provincial youth from a Western cowtown. On his return from England in the fall of 1927 Simpson joined the scientific staff of the American Museum of Natural History as assistant curator of fossil vertebrates. He accepted the museum's offer after rejecting an offer made by Yale University, which had vacillated because of malicious gossip about Simpson's treatment of his wife. At the American Museum Simpson replaced William Diller Matthew, who had left to assume the directorship of the museum of paleontology and chairmanship of the reestablished department of paleontology at the University of California, Berkeley. Matthew was impressed with Simpson's studies of Mesozoic mammals and with the endurance and diligence that the young scientist displayed as his field assistant in the baking summer heat of Texas when Simpson was a first-year graduate student at Yale. Having established himself as a paleomammalogist, Simpson wanted to continue his fossil mammal studies by examining the South American strata in Patagonia, which had yielded an unusual and important fauna that had evolved in isolation from the rest of the world during the long time that South America was an island-continent. Simpson befriended a museum patron, who put up the money--so critically short during the Depression years--for two expeditions to Patagonia, one in 1930-31 and 1933-34. In later life Simpson remarked that he spent many hours drinking with the patron in persuading him that the expeditions were necessary, and quipped that he only regretted that he had "but one liver to lose for my museum." Simpson's first book, "Attending Marvels," is a travel narrative of the first expedition. It was quite successful and brought Simpson notice from the world outside of paleontology, including a radio interview in New York City and front-page coverage in the "New York Times" Sunday Book Review. In the late 1930s and early 40s, Simpson's work turned more theoretical, as he shifted some of his attention to more general problems of evolution, rather than focusing solely on fossil mammals. Just before American entry into World War II, Simpson published "Quantitative Zoology," co-authored with his second wife Anne Roe (1939), and he completed two book-length manuscripts, which were published as "Tempo and Mode in Evolution" (1944) and "Principles of Classification and a Classification of Mammals" (1945). When Simpson left for South America in 1930, he had broken with Lydia, although they would not be legally separated until two years later and not finally divorced until 1938. Lydia had a history of mental problems that had begun even before she married Simpson; some were serious enough to require hospitalization. The daughters had been moved about, at times with Lydia, at other times with their grandparents, and occasionally with their father. Domestic life was by no means tranquil and one wonders if part of Simpson's motivation for his two South American expeditions wasn't the prospect of escape from an increasingly difficult situation at home. During his last year of graduate work at Yale, Simpson chanced to meet Anne Roe (1904-1991), his childhood friend from Denver, who was working for her doctorate in psychology at Columbia University. Great friends as children and teenagers, they had gradually lost touch. She had gone to Denver University while he went back East to Yale. Moreover, Anne had had a brief adolescent conversion to fundamentalist Christianity, which had rather discouraged Simpson. Thus, while staying friends, they had drifted apart. When Simpson saw Anne again in New York, he was much taken with her, and she with him. Both were now mature adults with fully developed, interesting personalities. Their renewed friendship quickly developed into a love that, obviously, could not be openly acknowledged. Within a few months Simpson left for his post-doctoral research in London, but he and Anne managed to correspond surreptitiously through his ever-reliable and supportive sister Martha. Anne came to realize the impossibility of their situation, and impetuously married while Simpson was in London. Rather than making things simpler, her marriage only created further complications, for Anne and Simpson began seeing each other again when he returned to New York in fall of 1927. By 1930, when Simpson left for a year's fossil-hunting in Patagonia, he was no longer living with Lydia, and Anne was questioning her own marriage. When Simpson returned in 1931, he immediately filed for a legal separation from Lydia, which he obtained in early 1932. For the next six years Anne, by now separated from her husband, and Simpson lived together whenever their respective jobs permitted them to do so. For a while, his sister Martha even joined the ménage, and all three happily lived together in a New York City apartment. Simpson eventually moved to Connecticut, commuting to the museum in New York, so he could file for divorce from Lydia on the grounds of mental cruelty, which was not then permissible in New York State. His eldest daughter, Helen, was living with him, attending a nearby private school as a day student; Patricia Gaylord (called "Gay" in the family) was living with her maternal grandmother in Kansas, and the two youngest daughters, Joan and Elizabeth, were in temporary custody of their mother, pending the outcome of the divorce and final custody arrangement. In April 1938, after a rather long court battle, Simpson was awarded a divorce from Lydia and custody of the two older children. (Not long afterward, he received custody of the other two girls as well.) A month later Simpson and Anne were married. Later that year they went to Venezuela on a fossil collecting expedition; Anne put aside her work in clinical psychology and collected various mammals for the museum. The following summer the happily married couple set up house in New York City and brought together the far-flung family for the first time in years, except for Gay, who remained in Kansas where she'd lived practically all her life. The next three years were tranquil: Anne was caring for the family and working part-time as editor and researcher, the girls were in junior and senior high school, and Simpson was working on Tempo and Mode and Classification of Mammals among many other projects. In 1942, the new director of the American Museum was contemplating reorganization of the various departments, which included combining the paleontologists with the zoologists, that is, putting scientists working with living groups with those studying fossils. For various reasons--some personal, others disciplinary--Simpson resisted this plan and became somewhat depressed about his future prospects. Before he was forced to make a decision, he enlisted in the armed services and in December, 1942, he joined military intelligence as a captain in the U.S. Army. He must have flustered his superiors for he completed a six-week course in intelligence methods in a single week. By spring of the following year he was in North Africa, as part of the Allied Forces Command led by General Dwight Eisenhower. He moved on to Sicily and Italy during the invasions in the summer of 1943 and returned later to North Africa, where he remained until the fall of 1944, when he was shipped home with a severe case of hepatitis. By then, he held the rank of major and had been awarded two Bronze Stars. When Simpson returned to the museum, the earlier reorganization plan had been scrapped and a different plan was imposed, which included a department of geology and paleontology of which Simpson was now named chairman. Simpson also accepted appointment as professor of vertebrate paleontology at Columbia University. In 1949 Simpson published a popular account of modern evolutionary theory from the point of view of the fossil evidence, "The Meaning of Evolution," which was subsequently translated into ten languages and sold some half-million copies. This book further familiarized the educated public with Simpson-the-scientist. A few years later, Simpson completely reworked "Tempo and Mode" into "Major Features of Evolution," which was considered by some a more ponderous, detailed version of what had previously been a succinct and brilliant monograph. In 1953 Simpson published a small volume, Evolution and Geography, that climaxed a series of writings published over more than a decade, all of which addressed the principles for explaining the past distributions of land animals, especially mammals of the Cenozoic Era, representing the last 65 million years of Earth history. Strongly contrary to the ideas of Alfred Wegener, the German scientist who argued that drifting continents carried fossils of land animals far and wide from their original distribution, Simpson made a cogent case for the natural dispersal mechanisms of organisms over long geologic time-intervals to accomplish the same results on continents that did not move. So great was Simpson's authority and so persuasive his reasoning that the theory of continental drift slipped still further in its credibility with North American geologists. Wrong for the right reasons, Simpson only converted to the new theory of plate tectonics when the geophysical evidence from the oceans provided compelling proof of seafloor spreading from mid-ocean ridges that carried the continents--and their resident floras and faunas--with them. Simpson, like most other scientists who live their allotted three-score-and-ten, was forced to acknowledge that what had been learned earlier in one's professional career was often either wrong, obsolete, or irrelevant. He did not relish the opportunity for recantation the way a number of his colleagues did, born-again enthusiasts for the new geology. The special place that Simpson enjoyed in the earlier revolution, that of the modern evolutionary synthesis, was visible beyond his contribution of learned treatises. Just before the war he helped found the new Society of Vertebrate Paleontology and became its first elected president. After the war he helped organize the Society for the Study of Evolution, which brought together a whole range of life-scientists, including paleontologists, working within the new paradigm of the modern synthetic theory of evolution. He was the society's first president and, later, when the society wanted to begin publishing its own journal, "Evolution," Simpson managed to arrange initial funding from the American Philosophical Society. In the summer of 1956 Simpson undertook yet another South American expedition, this time to the upper headwaters of the Amazon River in Brazil to collect fossils to fill in gaps between Argentina to the south and Colombia to the north. The area was so covered with vegetation that the best prospects for developing outcrops were along the river banks exposed during seasonal low-water. Simpson headed a small party of North and South American scientists, assisted by several Brazilian workmen. Near the end of their river trip, camp was being cleared along the river's edge. The field party did not like to camp on the boats in the river itself, but preferred making a campsite on dry land, even though it usually entailed hacking through thick vegetation and even chopping trees down. In late August, while one such camp site was being prepared, a newly cut tree fell on Simpson, causing multiple injuries, the most serious of which was a bad break of his lower right leg. After a painful and dangerous trip back down the river and a series of transfers from boats to planes, he arrived a week later in New York City. He spent the next two years in and out of hospitals, undergoing twelve separate operations--one of which was necessary to remove a surgical sponge had been left behind from the preceding operation. Simpson resisted all advice to have the leg amputated, and finally recovered the use of the leg, although it always pained him and he was somewhat lame. During this difficult time Simpson's second daughter died. Gay had been born with a congenital heart defect and had been shielded from most of her parents' marital problems by living with her maternal grandmother in Kansas. Recently married herself and working as a librarian, Gay died of a brain abscess at age 31. In 1958 Simpson gave up the chairmanship of the department of geology and paleontology at the American Museum, under pressure to do so from the museum's director. Shortly thereafter Simpson resigned from the American Museum altogether and was appointed to an Alexander Agassiz professorship at the Museum of Comparative Zoology, Harvard University. There had been some resentment among Simpson's colleagues of his periodic absence from the museum during his two-year convalescence and the delegation of his administrative chores to others. The director, intending to lessen Simpson's administrative burden, suggested he resign the chairmanship, but Simpson, feeling that under the circumstances he had been carrying out his responsibilities quite satisfactorily, was so insulted by the idea that he made up his mind to seek a position elsewhere. Despite the turmoil, Simpson managed to produce a major biology textbook, "Life: An Introduction to Biology," in collaboration with two other biologists, see into print a number of articles started before his accident, and write a number of book reviews. The centennial of Darwin's "On the Origin of Species" was celebrated in 1959, a year that not only signaled a fresh start for Simpson at Harvard but also brought him once again into the spotlight as a the leading evolutionist. Conferences, symposia, and special events marked the centennial, and Simpson was often present either as a contributor--as in Chicago where he gave a keynote public lecture at the annual meeting of the American Association for the Advancement of Science entitled "The World into Which Darwin Led Us"--or as an honoree--as in London where he received the Darwin-Wallace Commemorative Medal from the Linnean Society in whose meeting rooms, a century earlier, Charles Darwin and Alfred Russel Wallace's theory of natural selection as the mechanism for evolution was first announced. Darwin always held special interest for Simpson, not only for the obvious scientific reasons, but also because Darwin represented for Simpson the quintessential liberator of the human spirit, seeking to find answers to the puzzle of human existence without recourse to supernatural explanations. Simpson's own penchant for a naturalistic, positivistic view of the world was well reflected in his reading of Darwin. Thus Simpson regularly took the opportunity throughout his career to speak and write about Darwin for non-scientific or non-specialist audiences. Hence he was in his glory during the Darwin revival of the late 1950s. Simpson and his wife Anne settled in at Harvard. He was busily writing once again, but because of his accident serious fieldwork was over. She was eventually granted a full professorship in the Graduate School of Education, and they were thus the first married couple to receive professorial appointments at Harvard. They spent winters mostly in Cambridge, summers at their simple home in the New Mexico mountains, and managed a number of trips abroad, including England, France, and Spain, as well as Africa and Australia. These trips were as much opportunities to renew scientific friendships and receive further honors and awards as they were to examine fossil collections in museums and universities. The Simpsons had conversations with the Duke of Edinburgh, the granddaughter of Darwin, the Huxleys, and the Leakeys among others. Nor was Simpson ignored at home: in February 1966 he received the National Medal of Science from the late Lyndon B. Johnson, then President of the United States. Yet all was not unmitigated satisfaction. Simpson and Anne both suffered from heart attacks and were hospitalized. In fact, some of their traveling was in part intended as recuperation. And although, strictly speaking, Simpson's Agassiz Professorship at Harvard did not explicitly require residence at the museum, his frequent absences once again made for some difficulty with the administration. In 1967 the Simpsons decided to move to Tucson where they had earlier bought a house in preparation for retirement. He was given an appointment at the University of Arizona, which involved some teaching at first and later evolved to weekly luncheon meetings with interested students and faculty. By 1970, all formal ties with Harvard were severed. Simpson continued to publish books--on South American mammals, penguins, Darwin, fossils and the history of life, collections of essays, and his autobiography--as well as the usual monographs and articles on Cenozoic mammals, obituaries of deceased colleagues, and book reviews. He worked in a small building built next to his house, surrounded by his research files and extensive personal library, walls and surfaces scattered with honorary degrees, photographs from the past, and replicas of the many medals he had been awarded. Despite the change in locale and greatly increased domestic tranquility, Simpson's life did not alter much. Rather, his Arizona years reveal an intensification of everything that he really loved: close, daily contact with Anne; small, informal get-togethers with a few close friends; occasional visits from children and grandchildren; trips of varying length in the U.S. and abroad; association with the academy without much formal responsibility; and long stretches of time to devote to his research and writing with minimal interruption or distraction. At times there were periods when his or Anne's health was poor, which then required a slow building-up of energy and reserves to reestablish the routine. In the last decade of his life, as his friends and colleagues passed on, Simpson became more a memory from the past than a prime mover in the present. Most thoughtful students were aware of what he had contributed but now took it for granted. They looked to the writings of younger paleontologists and evolutionary biologists for new ideas. In a way, Simpson had outlived his fame, and had become a living, mostly ignored monument of what had come before. In the summer of 1984 Simpson contracted pneumonia during a South Pacific cruise. After returning home his condition worsened and he was in and out of the hospital several times over the next few months. He finally succumbed on the evening of Saturday, 6 October 1984, at the age of 82. His remains were privately cremated and later dispersed in the Arizona desert. Anne survived him for several more years, eventually dying in 1991.